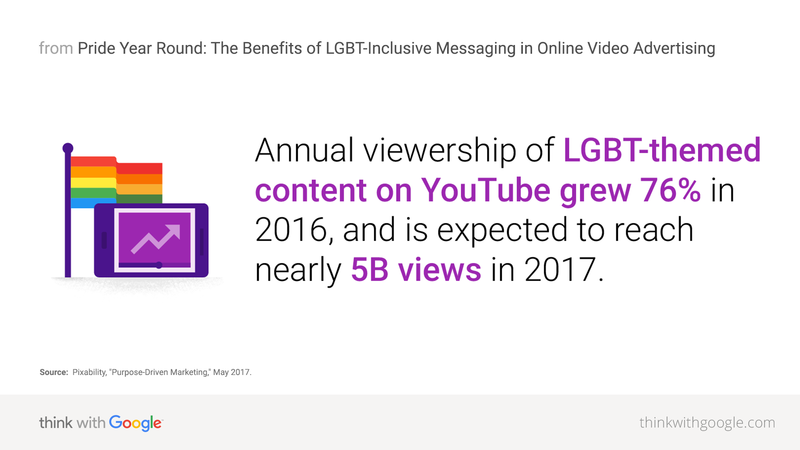 Every June, YouTube sees an uptick in LGBT content and interest—and an uptick in LGBT brand messaging, too. But research shows that a highly engaged online LGBT community, as well as millennial women more broadly, are eager for a year-round approach. Every year, we see a spike in LGBT content uploads in June on YouTube.1 June is, after all, LGBT Pride Month, an occasion for remembrance and celebration. It not only marks the anniversary of the devastating Stonewall Riots of 1969, but is also a milestone in the Pride movement: The Supreme Court decided in favor of gay marriage in June 2015. 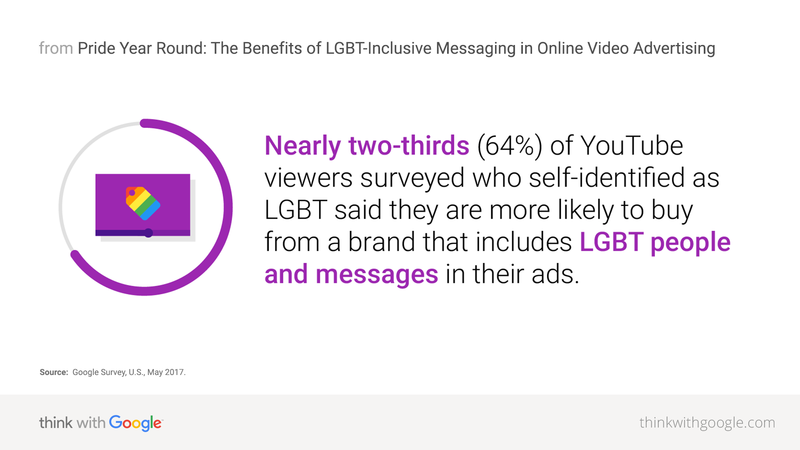 Brands interested in connecting with LGBT consumers often share Pride-centric messages in June. But it turns out that LGBT content provides opportunities well beyond June and beyond this key demographic. Source: Pixability, "Purpose-Driven Marketing," May 2017. What else should brands consider as they make their messaging more LGBT-inclusive? Source: Google Survey, U.S., May 2017. One example: Dove recently released a video as part of its Baby Dove launch. This spot isn’t the story of an LGBT family, but rather includes an LGBT family in the ad alongside other families. Source: YouTube Internal Data, Global, Jan.–Dec. 2014 and 2016. 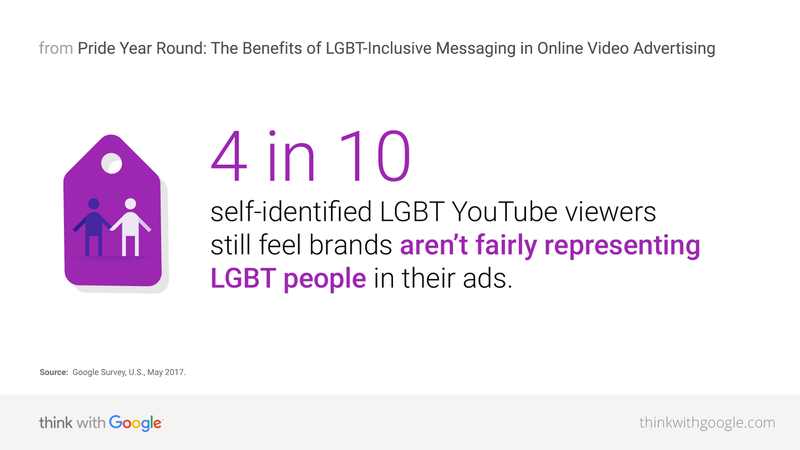 Millennial women on YouTube are more likely to remember and more likely to engage with a brand that’s LGBT-friendly in their ads. 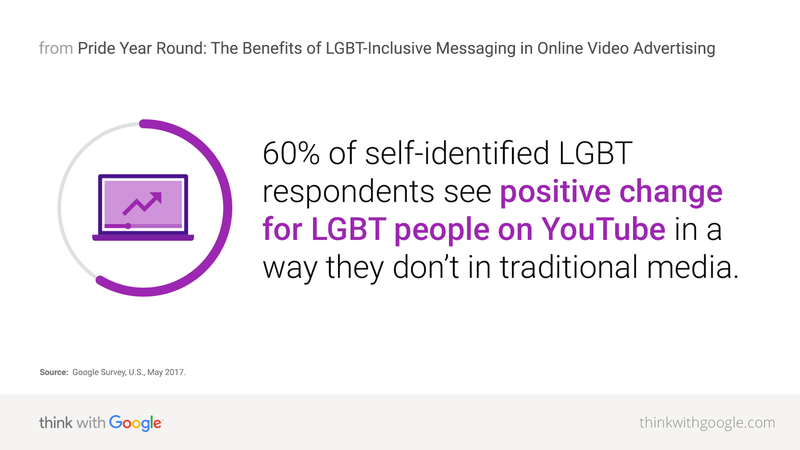 An engaged audience eager for more content is clearly an opportunity for progressive brands that can align with the LGBT community—and do so respectfully and authentically. As the data shows, the approach will not only grow the LGBT consumer base but is likely to garner the attention of wider audiences. 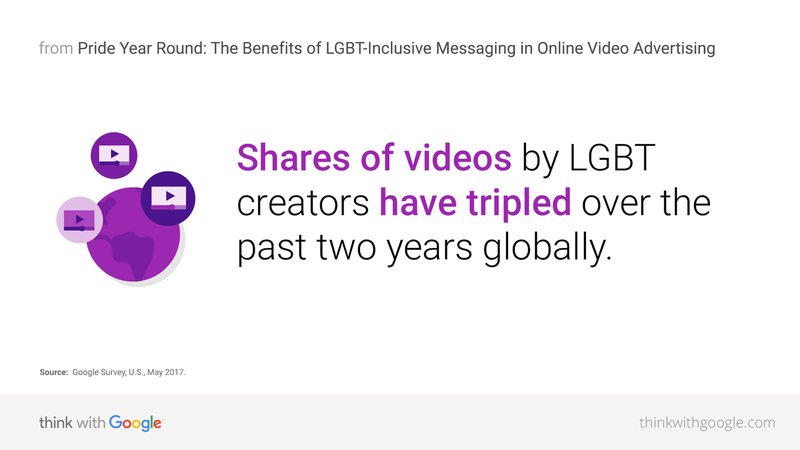 1 YouTube Data, Global, classification as LGBT video was based on public data such as headlines, tags, etc., and may not account for every such video available on YouTube, Jan. 2014–Mar. 2017. 2 YouTube Data, Global, Jan.–Dec. 2015 and 2016. 3,10 Pixability, Global, "Purpose-Driven Marketing," May 2017. 4,5,6,7,8 Google Survey, “How YouTube Audience Views LGBT-Inclusive Advertising,” U.S., n=361 YouTube viewers 18+ who identify themselves as LGBT (YouTube viewers defined as adults who visit YouTube at least once a month), May 2017. 9,11,13 YouTube Data, Global, classification as LGBT channel was based on public data such as headlines, tags, etc., and may not account for every such channel available on YouTube, Jan.–Dec. 2014 and 2016. 12 Google Survey, “How YouTube Audience Views LGBT-Inclusive Advertising,” U.S., n=187 YouTube male viewers 18–34 and n=189 YouTube female viewers 18–34 (YouTube viewers defined as adults who visit YouTube at least once a month), May 2016.